Samsung announces mass production of the eMMC Pro Class 1500 flash storage memory for mobile phones and tablets. This new memory is four times faster than previous eMMC solutions. Samsung Electronics Co., Ltd., the world leader in advanced memory technology, today announced that it has now begun volume production of an ultra-fast embedded memory for smartphones, tablets and other mobile devices in 16-, 32- and 64-gigabyte (GB) densities. The new Samsung eMMC (embedded multimedia card) Pro Class 1500 delivers the industry’s fastest speeds for an embedded memory device, reading data sequentially at up to 140 megabytes per second (MB/s) and writing it at up to 50 MB/s. For random reading and writing, it can process up to 3500/1500 IOPS (inputs and outputs per second)*, four times the speed of previous eMMC solutions. The Samsung eMMC Pro Class 1500 is designed for next generation premium mobile products. It will improve system performance and the user experience for a wide variety of applications including web browsing, 3D and HD video capture and playback, multi-tasking activities, augmented reality and the use of social networking sites and interactive graphics-rich gaming. The ultra high-speed storage device uses Samsung’s 64-gigabit (Gb) NAND with a toggle DDR 2.0 interface based on the company’s latest 20 nanometer class** process technology. The new eMMC’s fully managed NAND memory comes with its own high performance controller and intelligent flash management firmware. 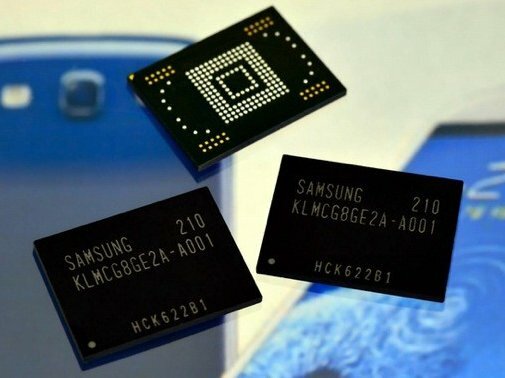 To meet the market need for thinner designs for high-end mobile devices, Samsung offers the new eMMCs in two, four- and eight-die stacks with the largest capacity of 64GB’s being only 1.2 millimeters thick. Samsung eMMC Pro Class 1500 is the first to support the latest JEDEC e-MMC v4.5 specification that standardizes more features to improve performance, efficiency, security, and reliability such as: a SDR-200 Interface (200MHz, 200MB/s Max Bandwidth), cache handling, dynamic handling, file sanitizing and power-off notification. Featuring highly reliable boot code and application storage, Samsung’s 64GB eMMC can store 16,000 MP3 files in a single package that weighs only 0.6 grams. Samsung provided the first 64GB eMMC in January of 2010 using 30nm-class** 32Gb NAND flash components.